Thank you for a fabulous field trip last Friday with the Preschool Children from St. Andrew's. It was well organized, educational and entertaining. The children loved it! They were very excited about their pumpkins. Thank you for providing such a wonderful opportunity for the children. Pumpkinfest is a great time for the whole family! 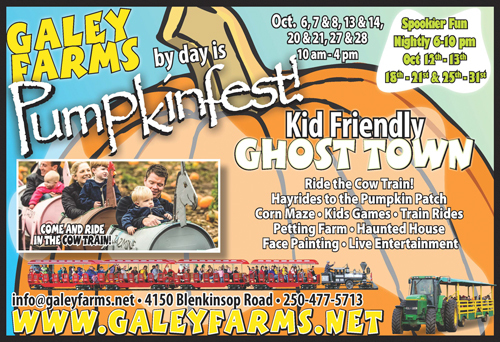 Featuring live entertainment, face painting, kids games, hay rides, u-pick pumpkins, train rides, corn maze, playground, petting farm, children's haunted house, fantastic seasonal displays and our Cow Train! This annual event is running October weekends 6th, 7th a& 8th, 13th & 14th, 20th & 21st, 27th & 28th from 10 am to 4 pm. Cost is $12 per adult $8 per child for one Train Ride ticket or one Corn Maze ticket. With your purchase of first ticket, second ticket at $6 (+taxes). Family Combo Pass (2 adults, 2 children) for $48 includes Corn Maze and Train Ride. 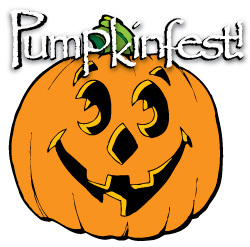 Hayrides and Petting Farm are complimentary only with the purchase of first ticket or separately $3 per person. Infants (not walking and must be accompanied by a parent) free. Seasonal ticket rate applies for Cow Train.